Federal Signal's Model 300GC SelecTone Speaker Amplifier is designed to produce crisp, clear tones, digital voice messages and live public address in harsh environments with high ambient noise levels. The rugged speaker cone and projector are constructed of spun aluminum. The internal circuitry, tone module, and gain control are contained in a housing constructed of die-cast aluminum. All surfaces are sealed with powder-coat paint. Dust and moisture-proof gaskets provide protection from the elements. Model 300GC is UL Listed for indoor and outdoor use and has been designed, tested and approved for use in Type 3R applications. Internal gain control allows output adjustment from 0dBa to a maximum of 110dBa at 10 feet. 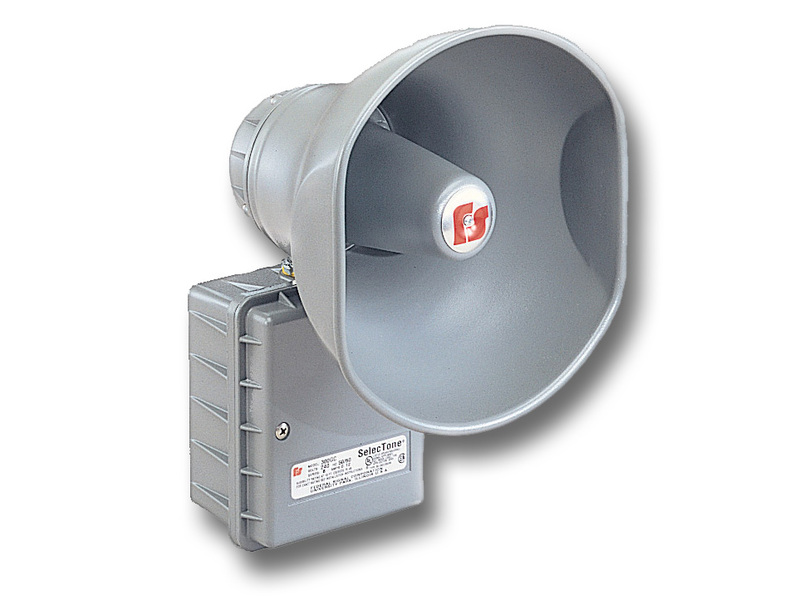 SelecTone Speaker Amplifiers are used individually or as part of a plant-wide emergency notification system. The Model UTM Universal Tone Module, with 32 tones, or the TM33 Custom Tone Module (both sold separately) is plugged into a single SelecTone Speaker Amplifier for stand-alone use or into a SelecTone Command Unit for plant-wide signaling. For plant-wide signaling, a Connector Kit (sold separately) is installed into each SelecTone Speaker Amplifier and wired to a central controller. SelecTone Command Units and CommCenter Digital Message Centers broadcast tones, voice messages, melodies and live public address to an unlimited number of SelecTone Speaker Amplifiers. Typical applications for SelecTone include emergency warning, plant evacuation, start and dismissal, public address, and process control signaling.